It would be a miss if you travel to Sapa without visiting Thac Bac (Silver Waterfall) and Cau May (Rattan bridge). Along with Ham Rong Mountain, Thac Bac and Cau May have constituted a marvelous but charming “City in mist”, Sapa. Coming to Thac Bac, tourists will have chance to join in the cool weather and grandiose landscape. Thac bac is considered one of the most beautiful waterfalls in Vietnam. Lying at a height of 500 meters, in sunny days, Thac Bac can be seen from Ham Rong Mountain. All year round, the white water flow pours down to the stream. It looks like a picture with two main colors: green from the forest and white from the waterfall. 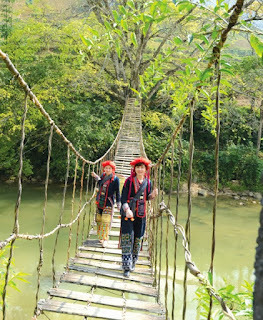 Cau May is a well-known bridge made from rattan which acrosses Muong Hoa River. If you visit the bridge in foggy days, you will feel like you are covered by cloud.